One day I went in a taxi by myself to [the day center for adults with disabilities]. Mama was against it, as always, but remembering what happens if she tries to keep me at home, let me go anyway. I wanted to give my chapbook to L–a – she wasn’t at her desk, but it was still worth it that I went! She asked if I didn’t want a different one, 56-06-06, I think it was. She said that she works there and would get me a discount (she said she would do it). She took me across the street and set me up there to wait for the taxi (and told the driver to help me), then she wished me well (In general, I have good luck). This is what I need in life: to talk to someone, to walk through the city, and not just to sit and sit in front of my computer screen. In this passage Vakas describes what might for someone else be a very mundane outing. In his hands, it becomes a fantastical adventure. His memoir writing, and his descriptions of his excursions out of his family apartment recorded in ethnographic interviews, often have a breathless quality of someone delighted by his own luck. As in this passage, he often describes moments of chance connection with strangers. These interactions give him a sense of satisfaction and unexpected delight. Vakas’s speech is slow and punctuated at unorthodox intervals by his breath, an effect of his brain injury. It might take Vakas a full 30 seconds to articulate a short sentence. This means that engaging people, especially strangers, in face-to-face communication is a daunting task. Vakas uses eye contact and facial expressions to show his interlocutors that he’s about to speak, and to hold their attention. Out in public, there is always a risk that someone will mistake him for drunk, seeing his shuffling, uneven walk, or hearing his slow speech as a drunken slur. This reality turns each twist of fate, each tiny kindness into a small miracle. In part because of this reality, Vakas finds much of his social life online. But Vakas’s descriptions of chance encounters and the kindness of strangers on the street carry a quality that his descriptions of online interactions approach but never fully achieve. This post explores how adults with disabilities in Russia are making meaning and building social worlds given circumstances in which it is difficult to leave a family apartment. Sharing excerpts from Vakas’s writing and interviews, I explore the patterns of sociality that he and other interlocutors create, especially through online social networks. I suggest that the particular pattern of social segregation that they inhabit and make livable – physically isolated in a family apartment, but digitally networked – is one that we might think of as pixelization, and consider to have implications beyond the segregation of people with disabilities. Disability rights and social inclusion movements in the West have, since the 1970s and 1980s, focused on access to public space for people with mobility impairments. Activists argued that social barriers – the attitudes and prejudices that reproduced and normalized the social exclusion of people with disabilities – would also be addressed by removing the physical barriers that keep people with disabilities from moving freely through public space. Today in Russia, many people with disabilities live in state-funded institutions, usually situated on the outskirts of towns and cities – literally on the margins of society. This model of segregation creates a spatial pattern of social exclusion that is familiar to social and cultural anthropologists thinking about segregation, exclusion, and inequality. While there has not been a major deinstitutionalization movement in Russia to match those in the West, many families have refused to institutionalize family members – especially children with disabilities. This contingent of people with disabilities is segregated according to a different socio-spatial pattern: they are isolated in family apartments. My interlocutors are adults with disabilities who were raised in this way – as children who were neither institutionalized nor integrated into the social world of their nondisabled peers. While many in this cohort attended specialized schools, and some continue to participate in occasional publically-funded or NGO-run programming for people with disabilities, adulthood has come with a new degree of social isolation for many of those with significant mobility or speech impairments. They spend most of their time at home in family apartments. A recent Human Rights Watch report observed that the barriers in the built environment of Russian public infrastructure create and re-inscribe social exclusion (HRW 2013). For example, apartment buildings – built between the 1950s and 1980s in this region – set the “first” floor up half a flight of stairs from the ground floor entrance, so that even those buildings which do have elevators do not have elevators that reach the ground floor. And, elevators are often too narrow to accommodate a wheelchair. One afternoon over tea, I was visiting Alina, a woman in her mid-30s who has cerebral palsy, or DTsP in Russian, at her apartment. Alina uses a manual wheelchair, which she can push on her own on very flat surfaces, and uses with assistance over uneven ground. The afternoon in question, I was recording an interview with Alina, and her mother, Valya, chimed in from time to time. Valya recalled a time when Alina was still a child. The work of caring for Alina – who needed assistance to go to the bathroom – made Valya’s commitment to working outside of the home ethically fraught. Alina: [to her mother] You didn’t say it right, I wasn’t alone, I always had a lot of people around… there were always people around me. Valya: I would leave the keys and the neighbors would come, it was simpler then. Alina, in this exchange, challenges her mother’s recollection that she was often home alone as a child. “I always had lots of people around me,” she counters, and goes on to assert her capabilities and array of experiences outside of the apartment. Alina rejects a description of her life that imagines her as isolated; instead she highlights her world as one of social ties. In doing so, she asserts her own social worth and the diversity of her experiences. Even now Alina spends many days in her apartment. However, in our conversations, she emphasized that she often has visitors, and has relationships with neighborhood children, neighbors, and with peers with whom she sometimes meets at programs and events that local social work agencies organize for adults with disabilities. She expressed opinions about world events, politics, and pop culture both during in-person interviews and in online correspondence, usually using the chat function on a popular social network. 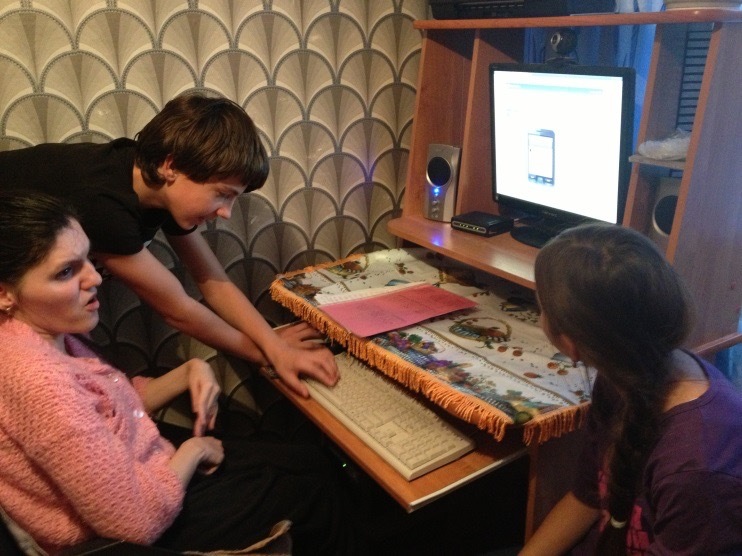 Alina talks with her neighbors at her computer desk, the log in screen for a social network site glows white on the screen, and one of the neighbors, a young boy of about twelve, leans over the keyboard while his younger sister looks on. Winter 2013. Photo taken by the author. In an in-person interview, Vakas told me a story that also illustrated the timbre of life in a family apartment. The text here was transcribed by hand, and the line breaks indicate Vakas’s unusual patterns of breath and pauses in the midst of his slow speech. Originally in Russian, I have translated the text, but retained line breaks to remind the reader of Vakas’s manner of speaking. -what happened, you fell down? [imitating a nagging parent] you fall – your teeth! your head! While he cherishes the moments when he does get to meet people face to face, on most days, Vakas finds social meaning through online communication on the Russian social network V Kontakte, which is similar to Facebook, and through the occasional excursions when he manages to convince his parents to let him go out alone or he steals away to visit acquaintances in the city. It was Vakas who first led me to consider the digital as an object of study rather than a mode of communication while I was in the field. Because he speaks slowly, and with a degree of difficulty, he sometimes prefers to share information online. When I hadn’t known him for very long, one afternoon I asked him a question in a group environment, and he suggested that he would send me an explanation online, rather than try to give an answer verbally. The digital option – messaging on VKontakte – offered a shortcut in what disability studies scholars call “crip time,” the elongated temporal frame in the performance of disability (Kuppers 2014; Hickman 2014). Crip time is an element of disability theory that is important for understanding the experience of technology in relation to disability or non-normative embodiments. Walking, talking, moving from one space to another, getting together with friends, or negotiating (in)accessible networks: all take on a particular temporality when one occupies a non-normative embodiment. To illustrate this contrast with cultural norms, as a quick way to winkingly let one another know what is at play, the anglophone disability studies community has come to call this non-normative temporality “crip time.” The ways that crip time takes on specific contours across cultural contexts, and in digital worlds, offers rich territory for current scholarship. Interviewing Vakas was an experience of entering crip time. The text of my interviews with him are transcribed in a manner related to Vakas’s performance of these words and my transcription of them. Because he speaks so slowly, Vakas asked that I not record his interviews on tape; over the years, he has been made to feel ashamed of his voice, and he didn’t want his perspective captured in this way. So, instead, as he talked, I would jot down his words in a notebook (in Russian, which I later typed and translated to English). Because I was writing longhand, and fairly quickly, his words would shortly fill a line on my notebook page. I used the natural breaks in his speech as a way to break up lines. This had a useful effect of also capturing something of the performance of his speech: his breath comes at irregular intervals that don’t necessarily correspond with punctuation in a sentence. Where most people will breathe at a comma or between phrases or sentences, Vakas often pauses to breathe or swallow mid-sentence. Listening to his narration of his own life has the effect of requiring the listener to enter into a co-performance of crip time. The transcription of his interviews reflects this. C: when do you usually get up? C: you hear him and get up? For Vakas, the moments in his day when he feels as if he is his true self, happen when his family leaves and he can go online, uninterrupted. Online, he is someone engaged in a social world through voluntary communication; he is part of a network of human connection. Online, he shares his writing, he makes new friends, he participates in public contests and events. Offline, in his family apartment, he feels forced to interact with family members, and because he isn’t allowed outside without someone to help him walk without falling, without his computer, he has no means of escape, and little chance to encounter surprises or build new relationships. Because digital platforms allow us to talk through walls, or communicate across space in ways that previous media did not, they have led to new configurations (boyd 2014). Digital communication, especially online social networks, played an important role in the narratives of selfhood for my interlocutors. In this way, digital platforms allowed them to access public spaces in ways that they were not able to do in the physical world. A screenshot from an online social network shows a message that Vakas recently sent me, recounting a recent conversation that he had online. He sent the transcript of the conversation to me to share his happiness that a young woman who he didn’t know had read some of his writing, and had written back and engaged him in a conversation. On the one hand, this shows the way that copy-and-paste and other manners of text sharing are a communication strategy for Vakas, extending his social modes of self-expression both across time and space. On the other hand, his choice to share this particular conversation reasserts to me his identity not as someone with a disability who spends many days at home, but as a writer and a savvy cultural actor whose work and communications are active and actualized. C: do you lie down? This mode of communication is not unique, of course, to those with mobility impairments. Many young people, especially those who are unemployed, spend hours of time each day online; they play games, talk to friends, or watch videos. What perhaps distinguishes Vakas’s crip digital social experience from gamer or computer junkie culture is that he does enjoy going out and meeting people in the real world, but practically, he rarely has the chance to do so – his desire to go out alone always causes fights with his parents, who want him to stay inside unless he is accompanied. Sometimes he goes out alone anyway, and, he tells me, he braces himself for the results when he gets home! But because digitally formed words are both persistent – in that they stay the same and are able to be read long after they are created – and mobile – in that they can be copied and cut and pasted between frameworks – he can easily use the same poetry text or description of himself over and over again. Because the tempos of conversation and communication in digital media occur at a different pace from spoken conversation and don’t require voiced speech, online he can participate in social life in a way that his speech impairment impedes in face to face communication. As a comparison of Vakas’s self-narration in his memoir versus his description of online interactions demonstrates, digital sociality and social engagement in the physical world are not equivalent, but both are important, because, in his words, communicating with people “gives him positive emotions.” In interviews and participant observation with adults with disabilities in Petrozavodsk, I observed that narratives of daily activities in virtual worlds came to stand in for other forms of sociality more frequently experienced by non-disabled people in their narratives of daily activities. There is a manner in which narratives of virtual sociality might be understood as crip technologies of self, performances of autonomy, competence, and mobility. I suggest that we might think about Vakas’s experience of digital sociality by extending metaphorically the idea of pixelization. That is, my interlocutors are socially segregated via a specific socio-spatial pattern. Unlike marginalization, in which a subculture is pushed to the edges of society, as for example, in former (and current) configurations in which people with disabilities were imprisoned in institutions at the edges of cities, pixelization doesn’t isolate people at the edges. Like pixels on a screen, people are isolated in the physical “cells” of their apartments, yet at the same time embedded and enlivened in networks that produce meaning-making interactions. The metaphor of pixels is especially apt given that my interlocutors are isolated in physical space at the same time that they seek out connection via digital networks. The digital world is a place where people are “typing themselves into being” (Sunden 2003, cited in boyd 2014:37); where people can leave behind their “‘material’ — or physical embodied — identities, enabling them to become a better version of themselves” (boyd 37). Digital platforms became a way for cultural actors to extend the space and time of their real-world social interactions. Face-to-face interactions continue beyond in-person conversations, into time when actors are alone, at home, or otherwise physically removed (boyd 3). Like the telephone and television before them, mobile devices and digital networks shift the space-time relations of bodies engaged in social relations. This mode of extending social space and time by engaging in digital sociality in moments of material isolation holds true for my interlocutors, who also seek interaction and feelings of togetherness. The configuration of crip embodiment and digitally enabled social selves that my interlocutors describe is a unique configuration of technology, architectural infrastructure, and cultural and personal expectations of self-making. The social world-making that my interlocutors, including Vakas and Alina, engage in can be thought of as both a process and a state of pixelization. That is although their bodies are physically isolated, their social selves extend in digital time and space. Social worlds, selves, and meaning are enacted, negotiated, and sustained. Their online interactions are (social) performances of interest and taste and involve making distinctions about who they are, who they are not, and what they desire. But pixelization is also limited by access to technology and by physical mobility. For example, mobile technology creates a situation in which you might send a message inviting someone to an event after you encounter them by chance at the bus stop. This was certainly the case in Petrozavodsk in 2012-2013 (at the time of my fieldwork). Digital and material sociality are intertextual experiences, that are difficult to disentangle from one another. Even so, face-to-face and online interactions have particular lexicons and conversations take on distinctive temporal characteristics. For example, Alina described her sense that talking online is always second best. She prefers to have visitors rather than just talk online; in her perception, communication is a way to set up in-person meetings. For her, digital interactions do not replace a conversation over tea – an experience that does require the movement of bodies through space, a shared emplacement. For Vakas, on the other hand, conversation online can be preferable, because, he explains, by copying and pasting text he has previously composed, he can communicate more ideas much more quickly than in a verbal exchange. In this way, pixelization doesn’t resolve problems, but it creates patterns. That is, owning an internet-enabled computer hasn’t ended the problems of discrimination and social segregation for people with disabilities in Russia. It is still difficult to get a job, to move freely through public space, to overcome social attitudes and build friendships with strangers, even as online networks make accessing entertainment, typing messages to friends and acquaintances, and engaging with popular culture easier. My interlocutors come to know themselves as social beings through mediated communication in digital space. Ginsburg and Rapp write that “disability is a profoundly relational category, always already created as a distinction from cultural ideas of normality” (2013:42). As cultural ideas of networked communication change, so too does the pattern of being socially engaged from within a spatially isolated zone: the concept of the margins is no longer sufficient to describe social exclusion. New metaphors (or metonyms) – such as pixelization – can offer conceptual innovation. If we pay attention to what anthropologists of disability call “sensory socialities” (Friedner and Helmreich 2012, cited in Ginsburg and Rapp 2013:48), we might note that pixelization creates a particular sensory experience of the social world. Seated before computers or other devices in tightly packed apartments, people may not be far from one another’s bodies in terms of strict physical proximity. Yet, visual and auditory insulating properties of walls can cultivate a sense of isolation and being alone. Through a variety of strategies, my interlocutors sought to create social experiences both on and offline in this social-material configuration. What can pixelization tell us about broader social patterns? In the lifeworlds of Vakas and other disabled interlocutors in Petrozavodsk, there is tension between being confined and being connected. Patterns of spatial engagement and isolation interface with modes of digital sociality. While barriers in architecture and social attitudes make moving into public spaces daunting, digital modes of sociality take on charged meanings. Even so, as mobile web technology has moved digitally networked communication into public space, Vakas continues to engage in the digital on a desktop computer in his apartment. Where communication across time and space is often thought to depend purely on technology, Vakas reminds us that crip time and crip embodiments, and the mobility and verbal style of particular human bodies, are always implicated in patterns of communication and sociality. Communication and social life happens with and through human bodies, and, in turn, makes worlds inhabitable. 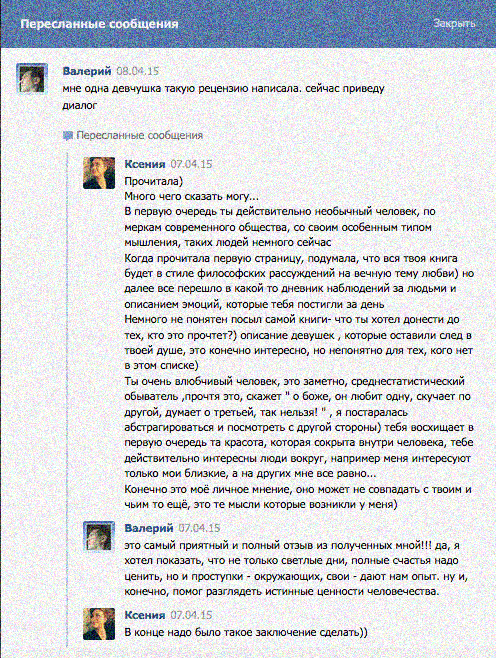 [i] Interviews excerpted here were conducted by the ethnographer in Russian. Interviews with Alina and Sergei were recorded digitally and transcribed by a research assistant. Interviews with Vakas were not recorded but simultaneously transcribed by hand by the ethnographer. All translations from Russian to English are the ethnographer’s own. Ginsburg, Faye. 2012. “Disability in the Digital Age.” In Digital Anthropology, edited by Heather A. Horst and Daniel Miller. New York: Berg. Ginsburg, Faye, and Rayna Rapp. 2013. “Disability Worlds.” Annual Review of Anthropology 42(1): 53–68. Hartblay, Cassandra. 2015. Inaccessibility Accessibility: An Ethnographic Account of Disability and Globalization in Contemporary Russia. Dissertation. UNC Chapel Hill. Hickman, Louise. 2014. Crip Time. A Video Performance. Presented at Society for Disability Studies. Minneapolis, June 2014. Horst, Heather A., and Daniel Miller, eds. 2012. Digital Anthropology. New York: Berg. Human Rights Watch (Organization). 2013. Barriers Everywhere: Lack of Accessibility for People with Disabilities in Russia. http://www.hrw.org/reports/2013/09/11/barriers-everywhere-0. Kuppers, Petra. 2014. Crip Time. Tikkun Magazine. http://www.tikkun.org/nextgen/crip-time. Milius, Vakas. 2014. Moi Mir Vzdokhnovleniia [My World of Inspiration]. Lipetsk: Grabis Press. In Russian. Sundén, J. 2003. Material Virtualities. New York: Peter Lang. Cassandra Hartblay is a 2015 Summer Research Fellow at the Kennan Institute of the Woodrow Wilson International Center for Scholars in Washington D.C. She received her PhD in Anthropology from the University of North Carolina at Chapel Hill in 2015. She was the 2013 recipient of the Irving K. Zola Award for Emerging Scholars in Disability Studies for her paper titled A Genealogy of (post-)Soviet Dependency: Disabling Productivity. She is currently developing a theater script for an ethnographic play based on the research related to this post. Hartblay C. Pixelization in Crip Time: Disability, Online Sociality, and Self-Making in Russian Apartments. Somatosphere. 2015. Available at: http://somatosphere.net/2015/pixelization-in-crip-time-disability-online-sociality-and-self-making-in-russian-apartments.html/. Accessed April 24, 2019. Hartblay, Cassandra. 2015. Pixelization in Crip Time: Disability, Online Sociality, and Self-Making in Russian Apartments. Somatosphere. http://somatosphere.net/2015/pixelization-in-crip-time-disability-online-sociality-and-self-making-in-russian-apartments.html/ (accessed April 24, 2019).